Zulily has a fun sale on Melissa & Doug play food sets! They have a ton of different options for up to 40% off. One of my favorite items included is the Personalized Cook’s Corner Wooden Kitchen pictured above for $87.99 (originally $135). 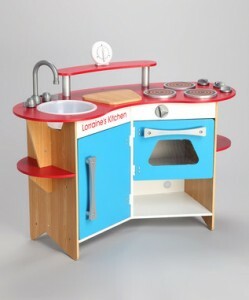 Some of the play sets include ice cream, pots and pans, sushi, cookies and more! The sale ends Monday, 7/30, but shop soon for the best selection. Zulily is also running a weekend shipping special where you will get FREE shipping on any additional orders place this weekend.